I went to see a Porcupine Tree gig last week and have to say as usual they were pretty stunning. 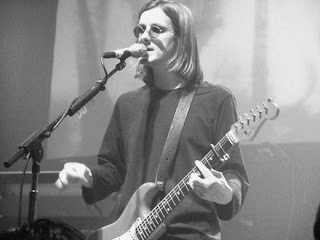 Their front man Steven Wilson (well, it's his band really) is a genius songwriter and although he looks like the guy on the beach you would kick sand over, what he lacks in physical stature he more than makes up for with breathtaking musical muscle. Go and buy their latest album "Fear Of A Blank Planet" which is only just released, it's hard hitting social comment to music. Steven Wilson writes music about everyday life and some of it is uncomfortable, but you cannot escape his musical genius no matter what. If your interested in pure progressive musicianship go and buy their albums and find out if they are playing somewhere near you. The only thing I am curious about is seeing as Steven is a Hemel Hempstead boy, why hasn't he penned a song called "Radioactive Buncefield " ? 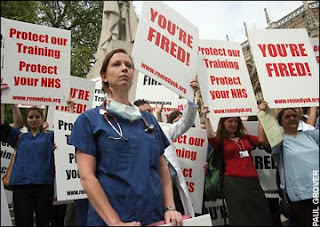 Can You Trust This Government To Keep Your Personal Records Private ? Frankly, the answer has to be a big resounding No. The recent revelation that junior doctors records have been available on the internet for all to see should worry us all. There may have been tons of spin from those who are supposedly guardians of our freedom and liberty telling us that access was limited and that it was only for a short time but the whole point is that the personal information was not fully protected. We are being told that if we have our private medical records on a central data base it will help us to receive better and quicker responsive treatment which will save our lives. Hmmm, maybe in theory this is true but if we cannot rely on those keeping the information to ensure it's security then we might as well take the risk on our health and keep our personal information well and truly private by not allowing it to be kept on a central data base anywhere. You can reject this scheme, it's your individual right so I suggest everyone who is uneasy about this current security lapse, and you should be, writes to their doctor and tell them you don't want your records put on any central data base. As for identity information on central data bases ...... be afraid, very afraid. I have just seen Within Temptation on their current tour and have to say that this Dutch band are a class act. Their music is inspiring and the audience were hanging on every note and singing the words along with the band. The audience ages ranged from about 15 to 60 which was amazing, but then why should good rock music be the sole domain of the young. I expect the older guys there have seen them all come and go from Hendrix through to today but on this night there was no doubt that good music is good music no matter how old you are ! Sharon den Adel has an amazing voice so go and catch them if you can but not this time cause if you haven't already got a ticket your out of luck. The UK leg of the tour is sold out !! Can't wait to see them again next time they're here though. It was a fantastic night. Well, we watched it last night and our two hopefuls didn't make it through ! Then what do we know ? It was tough to watch the emotion amongst the guys. Zoe was at it again, comforting the distraught and Denise was shedding buckets of tears as one by one they broke down and pleaded for a chance. This was T.V. in the raw and supercharged at that !! Don't mistake this for another reality T.V. show cause it aint no Big Brother by any stretch of the imagination. No contest Channel 4, pick up your cesspit and move on !! If I am to make a comment about the ones who got through it is to say we did not warm to Seamus, who had a side to him but couldn't put our finger right on it. Personality wise... hmmmm! If an unknown quantity is to get the part then Rob deserves it, he was a nice bloke. If another outsider should be in there it's Johndeep who despite the prejudices and cultural constraints on him from his origins gave it his all. Oh, and Chris is a good bet cause he has brilliant teeth. Well, wouldn't you have if your dad was a dentist. I cannot believe I am once again viewing another reality T.V. progrmme, but then again we are living in a funny old world. Last time I was a bit voiciferous about the search for "Maria" so what is different this time ? Well the panel for a start has four judges and my old friend Zoe Tyler pops up once again as vocal coach. During the Maria thingy I warmed to Zoe over the weeks, mainly because I read a bit about her background and found that the hard line T.V. personna she projected was in part T.V. posturing and not at all like her offstage image. I retracted my comments in my blog toward the end of the Maria series and I hope you read them Zoe. This first episode in the search for Joseph was dramatic and very good viewing. There are two or three very good potential Josephs in the finalists. Excuse please the names escape me but the guy from the Gospel choir that ALW went to visit and the young guy who was brought up by his nan and grandad are two we think have what it takes. To end, we were also very moved by the scene of Zoe comforting one candidate who never made it through. Did I feel awful about "Maria".... you bet I did. It was good to see Bill Kenwright and Denise Van Outen on the panel..... we will be watching tonight. For you lovers of really powerful industrial rock music check out the new RAMMSTEIN live album/DVD "VOLKERBALL". For £12.99 delivered from www.Play.com this amazing album/DVD features the very best of "smack you in the gob" heavy metal plus the pyrotechnics which overtook and surpassed KISS. Don't be put off by the fact that the vocals are only in German, they really do add another dimension to the music. I love them, they are eccentric, they make me laugh and they make me want to jump up and play air guitar. 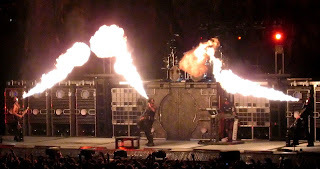 Long may they play.... RAMMSTEIN I salute you guys !! I am very pleased for the 15 military personnel and their families that they have been returned to the UK safe and sound. There are a lot of questions to be answered over this escapade not least how they were allowed to be captured in the first place with all the high tech assistance that was undoubtedly surrounding them. We should never loose sight of the fact that we are dealing with a very unstable Iranian Government with a warped sense of justice and they only just have one toe in the waters of the civilised world. Iran's behaviour was at the very least outrageous and appalling. However, it reminds me of the time just over a year ago when I was waiting in Bahrain airport for a flight to London and there waiting also to board the same plane was the Iranian Junior Karate team with their trainers/minders. They were so happy (loud and noisy) just like any other group of teenagers, clad in their official team tracksuits. I thought to myself then, on one hand there was Iran posturing to the world and taking delight in ignoring concerns over their nuclear aspirations, threatening death to British and Western people and on the other there was us welcoming their sportsmen with open arms to take part in competition in the country that was reviled so much. I was confused, but I came to the conclusion that the majority of normal decent civilised Iranians do not go along with the harsh rhetoric and mad posturing of the hard liners in their country mainly fuelled by the division between Islam and the West. When I saw the recent pictures on T.V. 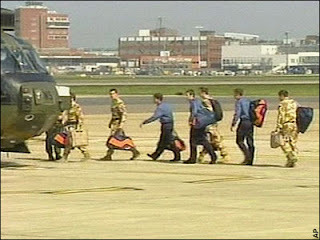 of the mobs in Iran baying for the blood of the 15 British military personnel my mind went back to those happy, charming kids who were on my flight to London one year previous. Was I right about the majority or is the left wing minority of hardliners just a myth ? Maybe it's time for the majority of normal decent people in Iran to make a move and send the rest of their "teams" out into the western world and embrace the waiting human race. I don't know about you but there is something very peaceful and beautiful about the Somerset countryside. 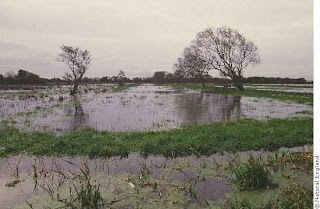 This time of the year everything is in a stage of renewal against the flatness of the levels, the wildlife, the willows and the riens which criss cross the landscape. I was driving from Taunton to Wells and what struck me as I went through Burrowbridge toward Street was the absolute mess of the farms on either side of the road in this area of "outstanding natural beauty". They made the township of Soweto in South Africa look positively upmarket, with their array of corrugated tin buildings which were falling down, paddocks / fields strewn with ancient broken down farm machinery left to rot where it lay, animals grazing amongst the rubbish left from unfinished bales of haylage with its polythene covers flapping in the wind. It was an eyesore and totally spoilt this beautiful area. Come on Somerset County Council, you can do better than this, get something done about it and promote the area as an area of "beauty" not a Council tip.